HOUGHTON, CHARLES FREDERICK, rancher, jp, politician, and militia officer; b. 26 April 1839 at Glashare Castle, County Kilkenny (Republic of Ireland); m. 27 March 1879 Marion Dunsmuir in Nanaimo, B.C. ; they had no children; d. 13 Aug. 1898 in Victoria. Charles Frederick Houghton entered the British army in 1855, and served for three years in the 57th Foot and then in the 20th Foot. In 1861 he was promoted captain. On 4 March 1863, Houghton’s friend Lieutenant Forbes George Vernon wrote from Clontarf Castle, Dublin, to the Colonial Office enquiring about land regulations in British Columbia. By this time Houghton had probably seen a colonization circular advertising free grants of 1,440 acres to military settlers with the rank of captain. Later that year he emigrated to British Columbia with Forbes Vernon and his brother Lieutenant Charles Albert Vernon. On landing at Victoria in September 1863, they discovered that the size of military grants had recently been reduced. Captain Henry Maynard Ball, magistrate at Lytton, advised him and the Vernons to settle in the Okanagan valley where land was cheap and cattle-ranching had begun. Each of the three men took up a 160-acre pre-emption near the head of Okanagan Lake. Houghton soon discovered that his staked land, on which he was operating a cattle ranch, impinged on the ten-square-mile government reserve set aside by Governor James Douglas* in 1862, and on 10 Nov. 1863 he complained to the governor. The following March he laid his case before the Legislative Council, and in June he appealed to the Duke of Cambridge, commander-in-chief of the British army. As a result of the duke’s intervention, Governor Frederick Seymour*, who succeeded Douglas in 1864, soon restored the military grant to its original size and permitted Houghton to retain as well part of the government reserve. Because of further questions that arose about the short time Houghton had held the rank of captain, he did not receive his crown grant for Coldstream, a property of 1,450 acres, until June 1872, and within a few months he sold it to the Vernons. The land was to form the nucleus of the famous 13,000-acre Coldstream Ranch, sold by Forbes Vernon to Lord’ Aberdeen [Hamilton-Gordon*] in 1891. Houghton’s geniality contributed to his popularity with the little group of “exiled thoroughbreds” in the British Columbia interior. He also had a gift for obtaining political favours: despite his limited military experience – he had only travelled as far as Malta during the Crimean War – and his newness to the country, he had been authorized by Seymour in 1864 and by British Columbia’s colonial secretary Arthur Nonus Birch in 1865 to lead exploratory expeditions through the Gold Range to the Columbia River mines. On 16 Oct. 1866 he was appointed justice of the peace. In the special election held after the colony entered confederation in July 1871, Houghton was elected on 19 December to the House of Commons for Yale-Kootenay. During his two sessions in Ottawa he gained the support of the mps and senators from British Columbia for the military appointment he desired. After he improved his credentials at the Quebec gunnery school, his rank was raised to lieutenant-colonel, and on 21 March 1873 he was appointed deputy adjutant-general of the militia for Military District No.11 (British Columbia). In the spring of 1877 the provincial government called on him to assist in suppressing a coal-miners’ strike at Robert Dunsmuir*’s Wellington colliery. In addition to the 60 infantrymen conveyed to Nanaimo from Victoria, Houghton used Grappler, a gunboat, and infantry and field artillery sent from New Westminster. He placed himself under the command of the Nanaimo magistrate and his force accompanied the sheriff, the police superintendent, and the special constables to the mine. There it was attacked during a riot by 150–200 colliers, and only four employees were ejected from company property. Dunsmuir appreciated the military intervention, and when the 39-year-old Houghton pressed his suit for the hand of Dunsmuir’s 22-year-old daughter, Marion, he made no difficulty. After their wedding Houghton took his bride to Europe for six months, and returned to find that his transfer to Military District No.10 (Manitoba and the North-West Territories) was probable. Discontent among the Métis and dissatisfaction among the farmers of the northwest grew after Houghton’s arrival in Winnipeg in April 1881. He began to organize the 90th (Winnipeg) Battalion of Rifles. 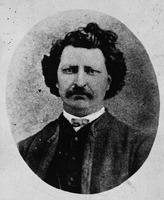 When in 1884 the situation worsened, Prime Minister Sir John A. Macdonald sought the opinion of his son, a Winnipeg lawyer, about Houghton’s suitability as a militia officer. Hugh John Macdonald* reported to his father that Houghton had “not much head and still less judgment,” and that “day in and day out he drinks more than is good for him.” On the eve of the outbreak of the North-West rebellion in March 1885 [see Louis Riel*], the government chose Major-General Frederick Dobson Middleton to suppress the uprising. Houghton deeply resented being passed over. Middleton found him “absolutely useless” as a member of his staff, but it was not until 19 May, after Houghton had fought at Fish Creek and Batoche (Sask. ), that Middleton sent him back to Winnipeg. Houghton was transferred on 1 March 1888 to Montreal, where nothing threatened the serenity of his command, but his social life was restricted by his wife’s delicate health. Early in 1892 he took her back to Victoria, where shortly thereafter she died at her mother’s Craigdarroch Castle. His daughter Marie, whose mother was Sophie N’Kwala, an Okanagan Indian, then kept him company in Montreal. Marie, who had been well schooled, later became widely known in the north Okanagan valley and was the author of a number of historical articles. Occasionally the Aberdeens, aware of their connection with Coldstream, invited them to Rideau Hall in Ottawa. An easy-going, sports-loving Irishman, Houghton had lacked the enterprise of the Vernons and other Anglo-Irish who settled in the Okanagan valley. When his health began to fail after his retirement in 1897, his old friend Charles Vernon cared for him at his Victoria home until his death in 1898. NA, RG 9, II, A1, 41, docket nos.6521, 6653; 51, docket no.7994. PABC, Add. mss 523; Add. mss 759, C. F. Cornwall, “The story of the coyote hounds” (1868–88); GR 1372, F 799, F 937. PRO, CO 60/15–17 (mfm. at PABC). Telegrams of the North-West campaign, 1885, ed. Desmond Morton and R. H. Roy (Toronto, 1972). Daily Colonist (Victoria), 7 May 1864; 16 Oct. 1866; 24 Oct. 1871; 4 March 1872; 24 Feb., 24 March 1877; 8, 30 March 1879;14 Feb. 1892; 14, 15 Aug. 1898. Montreal Daily Star, 16 Aug. 1898. Canada, an encyclopædia (Hopkins), 4: 512–13. Canadian directory of parl. (Johnson). Canadian men and women of the time (Morgan; 1898). Edna Oram, The history of Vernon, 1867–1937 (Vernon, B.C., 1985). Anne Pearson, An early history of Coldstream and Lavington (Vernon, 1986). A. J. Splawn, Ka-mi-akin, the last hero of the Yakimas (Portland, Oreg., 1917). Marie Houghton Brent, “Indian lore,” comp. Mrs Harold Cochrane, Okanagan Hist. Soc., Report (Vernon), 30(1966): 105–13. J. [K.] Nesbitt, “Old homes and families,” Daily Colonist (Victoria), 3 May 1953. Leonard Norris, “The explorations of Captain Houghton,” Okanagan Hist. and Natural Hist. Soc., Report (Vernon), 5 (1931): 30–32. M. A. Ormsby, “Captain Houghton’s exploratory trip, 1864,” Okanagan Hist. Soc., Report, 13 (1949): 38–44; “Some Irish figures in colonial days,” BCHQ, 14 (1950): 61–82. R. H. Roy, “The early militia and defence of British Columbia,” BCHQ, 18 (1954): 1–28. P. G. Silverman, “Military aid to civil power in British Columbia,” Pacific Northwest Quarterly (Seattle, Wash.), 61 (1970): 156–61. E. G. Turnbull, “Recollections of Marie Houghton Brent,” British Columbia Hist. News (Vancouver), 18 (1984), no.2: 21–22. Margaret A. Ormsby, “HOUGHTON, CHARLES FREDERICK,” in Dictionary of Canadian Biography, vol. 12, University of Toronto/Université Laval, 2003–, accessed April 22, 2019, http://www.biographi.ca/en/bio/houghton_charles_frederick_12E.html.